If we need to understand the importance of getting a CSM certification we should first look at the inherent demand in the sector, particularly around the areas of employment and availability of matching skill sets. Technology has changed. It is evolving at a rate faster than ever imagined. To keep pace, organisations are required to have an agile mindset and work culture and deliver high-value projects, at the same time meeting the changing customer requirements. Because of this business landscape riddled with flux, several corporations around the globe are adopting Scrum as the primary project management framework for their projects, especially when they are operating in a dynamic business environment. Not only IT, but other industries have begun to adopt Scrum as their preferred framework for their workflows and projects. 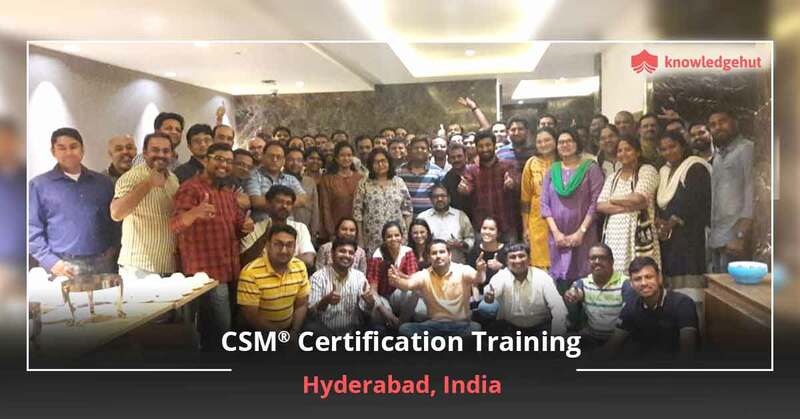 The CSM training in Hyderabad Scrum is specifically designed to cater to this insatiable need in the current market while continuously adapting to stay up to date. According to a report published by Scrumalliance.org, nearly 59% of all Scrum Masters are certified, and customer satisfaction is the end goal of almost all projects. Getting a certification isn’t difficult anymore as the Scrum Master certification cost in Hyderabad is quite competitive and in accordance with the excellence required by the industry. Scrum, if leveraged effectively can improve team workflows in an agile manner whilst upholding the quality of work to the highest standards! 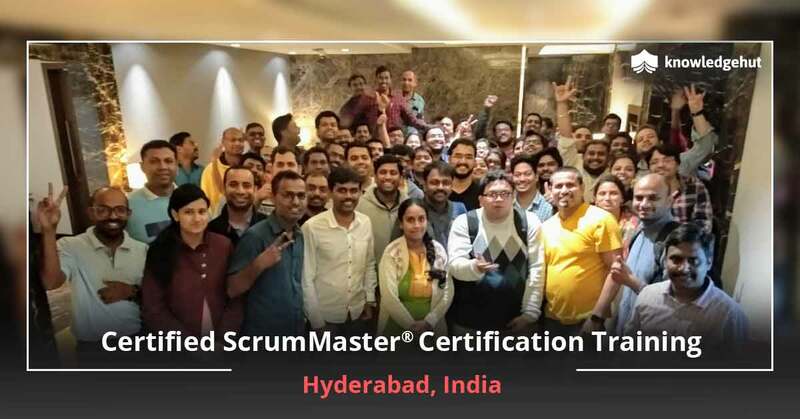 Professional credibility- The Scrum Master training in Hyderabad will enable you to boost your profile manyfold and have an edge over your non-certified peers. Skill growth- Stay a cut above the rest with the CSM training in Hyderabad whilst ensuring your skills help you stay innovative and agile. Salary- Get remunerated according to your agile skill-set. According to a TechBeacon report, the average salary of a Certified Scrum professional is on the upwards of $100k USD. Job search- Employers are always searching for certified agile and flexible professionals as it saves the organization from diverting resources to training which in turn acts as a cost saver to these enterprises. Professional growth- Picking up new skills is often advantageous for your career growth which requires you to enhance your skills every few years. Job essentials- Technology is evolving at such a pace that it has become important to stay a few steps ahead to remain competitive. As a Certified Scrum Master, be an agent of change and pick up skills to execute a task easily. Filling skills gaps- With the CSM training in Hyderabad, it is possible to fill skill gaps across the organisation as this deficiency remains a problem according to industry experts. 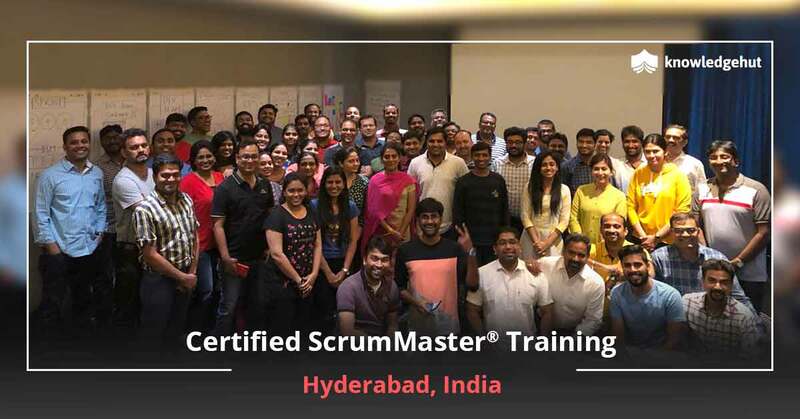 Increased engagement - The Certified Scrum Master workshop in Hyderabad will enable you to drive your growth through active engagement across platforms, allowing you to advance into the core team of the product development cycle as a whole. Continuous improvement - Without change there is no incentive for growth. This is what every organisation demands of their employees, and this requires rigorous mentoring on a personal as well as an organisational level. Be the beacon that holds up this value and see yourself scale heights. Problem-solving: The main skill that the Scrum Master should have is the ability to handle various complex situations during product development. Lean thinking: As a Scrum Master he must be able to identify wasteful processes and should be able to create a lean approach. Facilitation ability: The Scrum Master facilitates the Scrum events for team members and removes all impediments to the progress of the project. Coaching: As a Scrum Master he should be able to guide the Team members and coach them to follow Scrum principles properly. Scrum is a simple framework that focuses on the teamwork, communications, and speed to deliver complex projects. According to the McKinsey report, 5,400 IT projects overspend 45% on the projects because of projects overrun. Having a CSM certification declares you as a Scrum expert and you can avoid those shortfalls and boost the chances of accomplishing your projects successfully within a stipulated time. Become more proficient in Scrum after completing certifications offered by Scrum Alliance, the renowned Agile membership and certification organization. The certifying body always believes in a high level of personal interaction to understand Scrum, and the course model of Scrum Alliance fosters collaboration, increased productivity, and success among the team members. Membership of the Scrum Alliance community offers a platform where you can connect with other Scrum practitioners and get future growth through certification, knowledge sharing, and community support, which is very rare in the IT domain. The designation shows that an individual has undergone the Certified ScrumMaster® (CSM) course from a Certified Scrum Trainer (CST). This credential is awarded to the student once they have attended 16 hours of an intensive 2-day CSM course and passed the online CSM exam. Certified Scrum Masters can apply for the next level of certification which is the Advanced-Certified ScrumMaster®. There is no online/virtual course for CSM, as the Scrum Alliance believes that the understanding of Scrum requires a personal interaction at the highest level which cannot be delivered in a virtual/online environment. With this 2-year membership with Scrum Alliance, you can reach out to the local user groups and online social networks, get discounts on meetings, and enjoy additional member-only resources. Additionally, CSMs can use a specially designed logo to showcase their credentials. Will new job placement opportunities be available to me in Hyderabad after ScrumMaster training? The Scrum Master role has been gaining lots of popularity in recent years. According to Glassdoor’s 2018 salary report, Scrum Master is one of the highest paying jobs, ranking at number 20 with an average salary of $98,239. It has mounted two positions up as compared to the 2017 Glassdoor report. Scrum framework is simple to learn but difficult to implement. The organizations implementing Scrum for the first time, require the presence of a skilled Scrum Master on a team. Being a Certified ScrumMaster, an individual can play the role of a Business Analyst, Lead Software, Engineer, Project Manager, Information Technology, Staff Scrum Master, Delivery Lead, Agile, Scrum Master, Technical Program Manager, Senior Project Manager, Agile Coach, QA Automation Engineer, Software Project Lead, etc. The ScrumMaster certification is a great opportunity for the individuals who are seeking to accomplish success in their career along with the professionals who are looking for a job change in an Agile based environment. Take this certification to see yourself at the highest peak in your career. A large number of companies have started to embrace Agile methodology, 15 years after it was first introduced. Scrum Masters who have expertise in leading and directing Agile projects are much sought after in the corporate space. The latest State of Scrum report says that nearly 85% of their recent survey respondents have taken up Scrum Master certification and the whopping 63% success rate of Scrum projects explains why Scrum Master certification tops the charts. The next step after earning the CSM certification and a year of experience working as a Scrum Master on a Scrum Team is to get certified with Advanced Certified ScrumMaster (A-CSM℠) certification. The ScrumMaster® certification course offers training on the basics of Scrum which is essential for the Scrum team members or a Professional ScrumMaster. What are the prerequisites to attend the CSM certification training in Hyderabad? There are no prerequisites for this training. Interested candidates can attend this course. A degree of course completion from our Certified Scrum Trainer (CST) will make you eligible for online CSM test. Who should take this Scrum Alliance CSM training course in Hyderabad? In case you are already implementing Scrum in your organization, the certification course will add more value to your career. 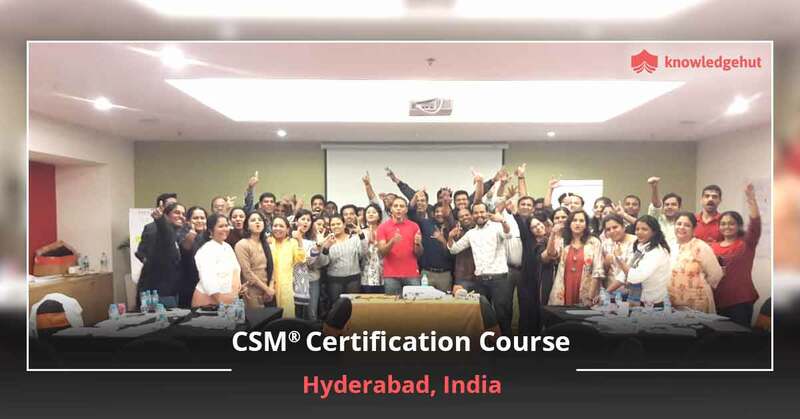 Who are the instructors/trainers for your CSM certification training in Hyderabad? Where will the Certified Scrum Master workshop be held in Hyderabad? The Cyan At Marigold By Greenpark- Greenlands, Begumpet, Hyderabad, Andhra Pradesh, India. 500016. Convention Centre At Novotel Hyderabad Convention Centre- Adjacent to Hitec City, P O Bag 1101, Cyberabad Post Office, Hyderabad. 500081. The Nova At Avasa Hotel- PLOT NO. 15, 24, 25 & 26, SURVEY NO.64, SECTOR-1, HUDA TECHNO ENCLAVE, MADHAPUR, HYDERABAD. 500081. Training location depends on the preference of most of the individuals, trainers available, venue availability etc. Be quick to find a location that is convenient to you and earn the industry-recognized credential! CSM online test cannot be taken without undergoing the Certified Scrum Master training since Scrum Alliance strongly believes in classroom training and practical experience. The CSM exam is not a substitute for formal training. No, membership of Scrum Alliance® is not mandatory to attend the training. Once you have finished CSM training you can join the Scrum Alliance. 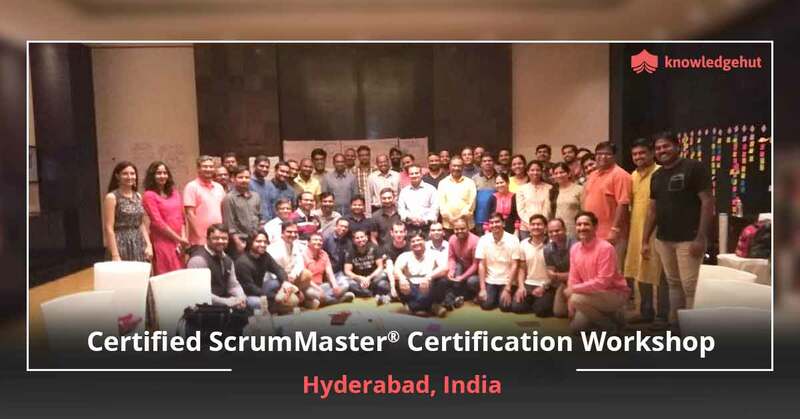 Is your 2 days of training at Hyderabad sufficient to clear the Scrum Master certification exam? If you are familiar with the Scrum fundamentals then 2-days of CSM training is enough to clear the Scrum Master certification exam. After finishing your CSM course, you will get an email from Scrum Alliance including a link to create your login credentials. From the time you receive a membership email, you have 90 days to take and complete the test. Our accomplished and very qualified coaches convey intuitive training programme with concise, clear, and updated materials to enable you to comprehend the ideas and pass your CSM test without any trouble. What are the Corporates Trained By KnowledgeHut in Hyderabad? Certified ScrumMaster® exam is an open-book exam and easy to clear. CSM training session is based on the team activities that help you in gaining knowledge on Scrum and its practical implementation, which are the more important aspects to understand the Scrum framework. The Certified ScrumMaster certification exam is an online test comprising of 50 multiple choice questions and candidates will have 1-hour (60 minutes) to finish it. A candidate has to score 74% in the exam to pass the Scrum Master certification exam and obtain the certification. Also, you can take the exam only after completing the course. How much does the Certified Scrum Master certification exam cost in Hyderabad? The Scrum Alliance CSM certification exam fee is included in the CSM certification training cost. Yes. After receiving the welcome email from Scrum Alliance, you are allowed to take the Scrum Master exam at no cost for the first 2 attempts within 90 days. You will be charged a minimum of $25 each from the third attempt or after finishing your 90 days. As per the Scrum Alliance, the candidates who failed thrice in the exam should retake the CSM certification course. CSM is renowned as the first professional certification by Scrum Alliance. This certification is for the Scrum Masters to gain a strong understanding of the overall Scrum framework. By obtaining this certification, you will be guiding the Scrum team to work together and perform to their best potential. Certified Scrum Master (CSM®) certification is a globally renowned certification offered by the reputed Scrum Alliance. This credential is offered to professionals who have sound knowledge in Scrum framework, practices, principles, and associated job roles. Also, this certification enables you to increase your skills in Agile and Scrum practices and provides you with an opportunity to be a member of the Scrum Alliance for 2 years. As Scrum is one of the most recognised and globally accepted frameworks, Scrum Masters are in demand regardless of the industry type. So, you should go for Scrum Master certification if your company is planning to switch to Agile methodology. Who offers the CSM certification in Hyderabad? You will receive the CSM certification from Scrum Alliance, the largest and most influential professional Agile membership and certification organization. CSM is the most popular certification for the Scrum Masters announced by Scrum Alliance as this certification provides a baseline knowledge of the Scrum process and fundamental aspects of the whole Scrum framework. Scrum is a leading Agile technology used by many companies around the world to tackle complex projects. Hence, the demand for certified Scrum Professionals has increased. What is the average salary of a Certified ScrumMaster® Professional in Hyderabad? Payscale reported that the average pay for a Certified Scrummaster (CSM) in Hyderabad, Andhra Pradesh is Rs. 1,249,301 per year. The crucial skills that may impact the individuals’ salary are Agile, Agile Software Development, ScrumMaster, Project Management, Scrum, Business Analysis. As companies are moving on to Agile, they have realized that the Scrum Master plays the vital and core role in making the team more productive, self-organized and follow the Agile and Scrum practices. The factors that decide the salary of the Scrum Master are knowledge, skills and experience that you bring back to the organization. The average salary of an experienced Certified Scrummaster (CSM) in Hyderabad is Rs. 1,370,357 per year. 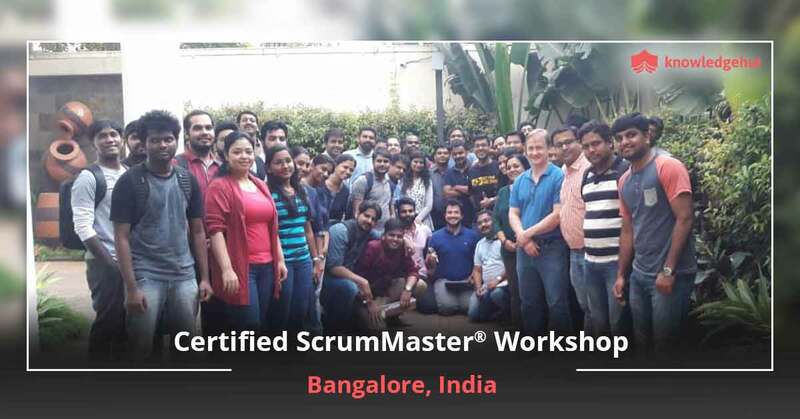 Being a Certified ScrumMaster, you can undertake roles like Software Engineer, Product Manager, Project Manager, Team Leader, Business Analyst, Development team member, Testers etc. and the designations an individual can play in the organizations are Business Analyst, Lead Software, Engineer, Project Manager, Information Technology, Staff Scrum Master, Delivery Lead, Agile, Scrum Master, Technical Program Manager, Senior Project Manager, Agile Coach, QA Automation Engineer, Software Project Lead, etc. You need to pay $100 to renew CSM certification. The renewal process needs to be done every 2 years from the current expiration date. In order to renew your ScrumMaster certification, log in to https://www.scrumalliance.org/login, go to the Dashboard, choose the ‘Renew Certification’ option available under the heading ‘Actions’. Note that starting from February 4, 2019, you will be required to have earned 20 Scrum Educational Units (SEUs) within the past two years, in addition to the $100 renewal fee that has to be paid. Your participation and continued proficiency in the fundamental principles and practices of Scrum is validated by the new requirement which has been mandated by the Scrum Alliance. You can earn the required SEUs by completing an educational training or a learning opportunity. PDUs and SEUs are the credits awarded by the Project Management Institute and the Scrum Alliance respectively. These units indicate your commitment to the Agile world by awarding credits for every educational effort you make throughout your career. Scrum Alliance members need to earn SEUs to get re-certified every two years. PDUs are offered by the PMI®, and every PMI® certification, except the CAPM®, requires to earn a specific number of PDUs per three-year certification cycle. You can earn 14-16 PDUs and SEUs by participating in our two-days training program. Sergey Dmitriev is a scrum evangelist focused on improvement of business processes, management and strategy consulting. Sergey’s expertise lies in helping organizations transform to agile or to improve their existing agile practices. He facilitates team coaching, training, mentoring and also meeting and workshop facilitation. His qualifications include a Scrum Master, Scrum Product Owner, Scrum Practitioner and (PMP PMI) Project Manager Certifications. His hobby is diving and he is passionate about deep and wreck diving or a combination of both. Hyderabad has a vibrant software industry and offers immense scope for software professionals in Agile & Scrum. A CSM certification in Hyderabad is just what you need to climb the success ladder. Becoming a Certified Scrum Master gives you the knowledge needed to successfully implement the various concepts and ideology of Scrum and take your agile project to success. KnowledgeHut brings you a Certified Scrum Master training in Hyderabad that is aimed at equipping you with the skills needed to successfully practice Scrum at your workplace. What makes our Certified Scrum Master certification Hyderabad edition different from other coaching centres is that our instructors teach with the aim of preparing you for on-the-job-challenges rather than simply giving out information with the aim of passing the exam. The CSM exam is intensive and requires a level of commitment from both the students and the instructors to get through. We ensure you that there will be no shortage of commitment from our side. The CSM certification cost in Hyderabad is included in the course fee. You will get a number of add-ons from instruction to courseware to practical exercises. Our participants have benefited hugely from our hands-on approach and the coaching from industry experts has been widely appreciated. As a result several of our participants are now holding valued Scrum Master positions in top companies. You can be next! Enrol today and get set for a glittering career.